Good-Bye 2016! – It's a T-Sweets day! Published on January 23, 2019 by Tracy @ It's a T-Sweets Day! I always wonder why some quilts seem to stitch up in no time at all while others wait and wait. There always seems to be a project with a deadline, or that is newer and fresher to work on. I must admit that there were times I even forgot that I had this quilt in the que! Oh well, it is finished now and I love it;). I love the off set flowery blocks and the checkered borders. The white space on each corner was the perfect place for embroidering a name and a date for the lucky recipients who just happened to get married this past weekend. The backing is cute too. That light blue with little roses is just perfect! I like the contrast of the dark blue binding. 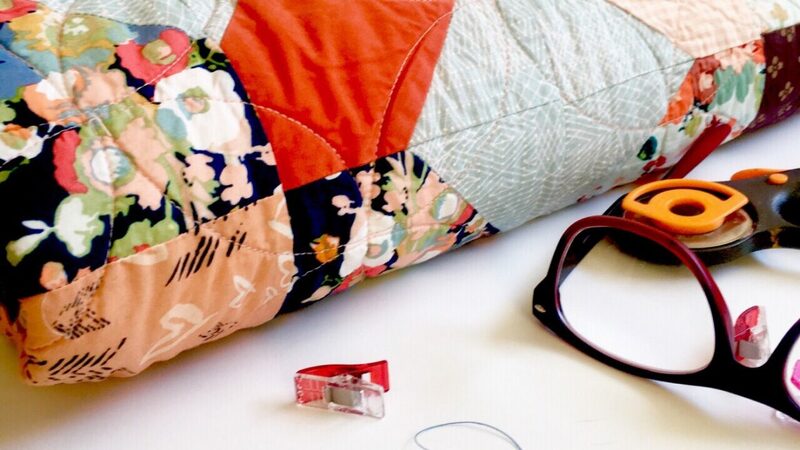 I always like binding a quilt. The process makes me happy and the finished result really completes the quilt. If you need a tutorial for perfect machine stitched binding, I have a tutorial here. It is time to neatly fold and wrap this beauty up and give it away. I am sure my dear, SWEET nephew and new niece are going to enjoy taking it on trips and snuggling up on a cool morning with it! Thank you so much for dropping by today. I hope you have a wonderful day! Well done, tracy. Its beautiful!! This is such a beautiful quilt, so gorgeous! I love the little touch of embroidery that you did! I’m currently making my mom a memory quilt and I’ve been thinking about adding some embroidery to it as well! Thanks for sharing about the stitched binding. I think I might try that method this time!! Cute quilt and congratulations on your finish! Lovely Tracy!! I’m sure your nephew & new wife will be thrilled. Take care. Another beauty! Love all the colors and patterns you chose! Very, very pretty, and a big bravo on reducing your ‘quilts-in-waiting pile’. Now, it’s time for Delilah! Beautiful Tracy! They will love it. Congratulations on your finish! The quilt is beautiful! I so love that checkered border! You do such a great job! Such a beauty, I enjoy the brilliant colors! Yes, almost like antique fabrics!